If a shark is sighted, stay calm and maintain your position in as quiet a manner as possible. Most sharks merely are curious and will leave on their own accord. Enjoy your opportunity to see one of nature’s most magnificent predators. If you have been spearfishing or abalone gathering and are holding your catch, release the catch and quietly exit the area. It is likely that the shark has been attracted to the sound and smells associated with your activity and it is aroused and interested in consuming your catch. Let it have it – no catch is worth the risk of personal injury. If a shark begins to get too interested in you by coming closer and closer, the best strategy is to leave the water – swim quickly but smoothly, watching the shark all the time, with your dive partner close at hand. 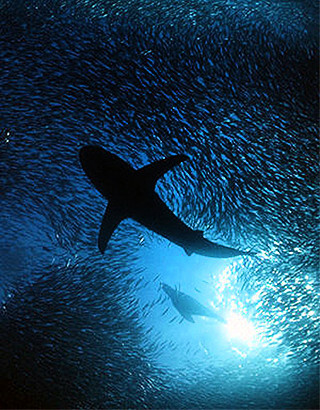 Sharks are less likely to attack a “school” of divers than a solitary individual. If a shark is acting overtly aggressive – making rushes at you, hunching its back, lowering its pectoral (paired side) fins, swimming in a rapid zigzag course, or swimming with rapid up and down movements (sometimes rubbing its belly on the bottom) – look to back up against whatever structure (reef, rock outcropping, piling) is available, thereby reducing the angles with which the shark can approach you. If you are in open water, orient back-to-back with your dive partner and gradually rise to the surface and the safety of your boat. If you are shore diving, gradually descend to the bottom so you can find cover. Use whatever inanimate equipment (speargun, pole-spear, camera) you have with you to fend off the shark (when diving in known shark-inhabited waters, it is always good to carry a pole or spear for this purpose). If a shark attacks, the best strategy is to hit it on the tip of its nose. This usually results in the shark retreating. If the retreat is far enough away, then human retreat is in order – again, swim quickly but smoothly, watching the shark all the time, with your dive partner close at hand. An aggressive shark often will return, however, and each subsequent hit to the snout will be less effective, so take advantage of any escape opportunities. If you do not have anything to poke with, use your hand, but remember that the mouth is close to the nose, so be accurate! If a shark actually gets you in its mouth, we advise to be as aggressively defensive as you are able. “Playing dead” does not work. Pound the shark in any way possible. Try to claw at the eyes and gill openings, two very sensitive areas. Once released, do all you can to exit the water as quickly as possible because with your blood in the water, the shark very well could return for a repeat attack.